Problem on number questions have been asked in many competitive exams and there are strong chances to ask number questions again in SSC, Bank and other competitive exams. Students should prepare for exams by practicing problem on number questions and answers. Problem on number questions are important and 1-2 questions asked in exams every year, try to solve Problem on number aptitude questions and answers for better results in upcoming competitive exams. Problems are part of our life but every problem has a solution. 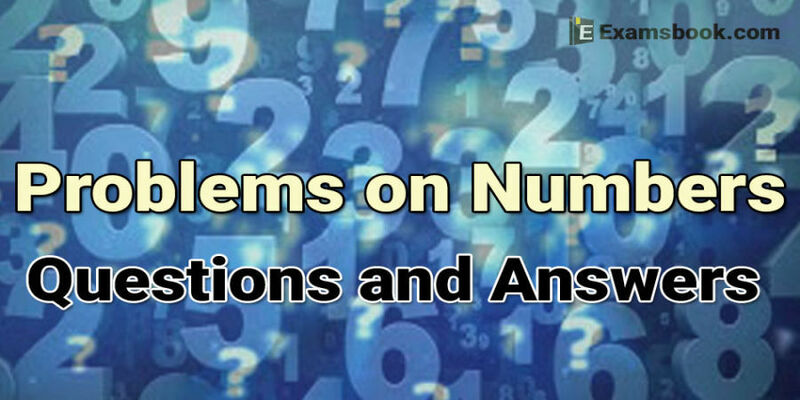 So, here you can learn the numbers problems with solutions by one click for better the preparation of your competitive exams as well as Number Series Problems with Solutions. 3. The product of two number is 192 and the sum of these two number is 28. What is the smaller of these two number? Ask me in the comment section, If you face any problem while solving number questions. Visit next page for more Problem on number questions and answers. 9. What is the sum of two consecutive even number, the difference of whose squares is 84? 12. The sum of the digits of a two-digit number is 9 less than the number. Which of the following digits is at unit’s place of the number? 13. The difference between a two-digit number and the number obtained by interchanging the two digits is 63. Which is the smaller of the two number? 14. The sum of two number is 25 and their difference is 13. Find their product. 16. The difference between two integers is 5. Their product is 500. Find the numbers. 20. The sum of three consecutive odd number is 20 more than the first of these numbers. What is the middle number? 21. The sum of three consecutive multiples of 3 is 72. What is the largest number? 22. The sum of the squares of three consecutive natural number is 2030. What is the middle number? 25. The difference between a two-digit number and the number obtained by interchanging the position of its digits is 36. What is the difference between the two digits of that number? 26. The sum of the digits of a two-digit number is of the difference between the number and the number obtained by interchanging the position of the digits. What is definitely the difference between the digits of that number? Providing knowledgable questions of Reasoning and Aptitude for the competitive exams.